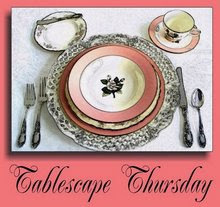 It’s time for Tablescape Thursday with our hostess with the mostest, Susan at Between Naps on the Porch! Please be sure to stop by her beautiful blog to see one of her amazing tablescapes and to find out who else will be participating this week! And like the proverbial white rabbit, I’m late, I’m late for my dear friend Barb’s Tea Time Tuesday at Grits and Glamour! 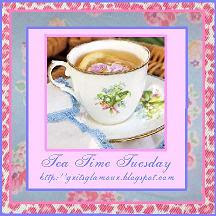 Be sure to stop by her blog for some yummy looking tea time goodies and to see who else came to the tea party! I was Goodwill hunting with my friend Linda at Nina’s Nest when I came across this little cutie for a steal! Well…my heart just melted and I had to have it because, as you can see, it’s a Hey Diddle Diddle tea set! That is my all time favorite nursery rhyme!! Are you surprised? Maybe it’s the cat with a fiddle! Baby Kitty got all excited when he saw me pulling out my camera and playing with my dishes because that means he gets to play co-host! Being the clever star that he is, he never misses a photo op! Just look at this little tea pot! Isn’t it darling? I actually saw the set online for $45!! I paid $4.54 for mine! I love the little cow handle! Aren’t the little cups precious? I love the star handles! It also helps that the tea set is blue and yellow…my favorite colors! It even came with its own Blue Moon tea! Will I drink it?? Uhhhh…probably not! But the box sure is cute!! …a sugar and creamer! Baby Kitty want to show you this milk glass pair that I also found at GW! I love the fruit design! But Baby Kitty is anxious for you to see what a bargain they were…88 cents each! I found them online for $15 for the pair! Wooo hooo! I think they might be Westmoreland milk glass, too! There you have my Blue Moon tea party! Baby Kitty and I are so glad you dropped by! Please be sure to head on over to Susan’s and to Barb’s to continue your tour de tea and tablescapes! See you next time! A la prochaine! I love this, Debbie. Oh, so cute! And that Baby Kitty looks so much like Alfie. He was my favorite cat I ever had, and oh, such a star, too. It must be something about those orange and white big boys. They like to mug for the camera. LOL! You got a great deal on your finds. I want to shop with YOU! This is all just adorable! Great bargains too! Goodwill???? Who would ever give this up??? The milk glass C & S is fabulous also! Debbie, another great find. Figural tea pots can be fun and full of whimsey as this one proves. Thanks for sharing. Your tea set is adorable! My guess is the dog ran after the dish and the spoon, you know how they like to chase things that run. It is just too cute! I loooovvvveeee the creamer set! What a really sweet tea set too! Sweet and cute. I just love the little creamer and sugar set! Oh Debbie , I love your teapot ! Those little creamers and sugar for 88 cents is great ! I love your co-star ! Where did your kitty get model lessons ? Debbie, this is absolutely adorable!! Hi Debbie! I LOVE your new teapot and accessories. What a fantastic find - I enjoy finding unusual, not to mention just plain cute, teapots. PS - thanks for visiting my book site! Your cat is so cute..., like a little person, and star of the tablescape! Hi Debbie! Oh, what a precious little tea set! Never seen anything like this and matching tea to boot! Baby Kitty is a darling co-host! Look at that little face! How cute!! I love the MG, I often find mine @ GW too! Happy TT! Oh Debbie...I love this!!! My grandbaby room is done in the theme of Hey Diddle Diddle!!! It is one of my favorites too!!! Maybe one day I will do a post about it!!! Your tea set is just the cutest thing and I love that your sweet kitty has joined in on the fun!!! I always love visiting here...you have such a way with words!!! That is the most adorable tea pot. I just love it. Kitty has very good taste and looks like a guest who is very appreciative. Hi, I love your new tea pot. Blue Moon Tea? I never heard of it but I am sure it taste Yummy! Happy Tablescape Thursday. It is just darling!!! You found some good deals. My GW doesn't sell anything for less than a dollar. I love the cow handle. That's a fun post! Great bargains too... good eye! Have a good rest of the week! Debbie, What a darling tea set and such a great buy. Of course, my favorite is Baby Kitty, what a cutie. Your favorite nursery and you walk into the thrift store and there sit a tea set just for you. So very serendipitous! It is so darling! Your kitty is adorable! That is a darling tea pot. I've seen cow creamers, but not the whole tea pot. I love a good deal. Cute kitty. Debbie... there is nothing quite as satisfying as a fabulous bargain from the thrift store! You dun good! One of my favorite stores! Your kitty just captured my heart, but do not tell my little Daisy. She is the jealous type. That tea set is just precious! Never seen anything like it. I love that nursery rhyme as well. What a cute table. My dog Abi likes to be in the pics too. I love your "co-host". Sooo cute!!! That set is adorable and it looks like your kitty is saying"Why are you taking my picture again, you know I have a limit per day! So cute. Debbie, this has to be one of your favorite finds of all times. I really enjoyed seeing your little setting and for sure enjoy Baby Kitty! Thanks for the smiles today. What a great find. I can see why you fell in love with it. It's just darling. Your kitty is a little ham. So sweet! what a charming table and blog you have! Thanks for sharing your lovely whimsical tea set...the milk grass is lovely too! Awe! Love the sweet Tea Pot! A perfect setting! All I could think of reading this post was Alice in Wonderland. Baby Kitty looms so large over your sweet tea set. With the music playing in the background today's blog post is simply enchanting. Debbie, this is abolutley adorable. I love Baby Kitty's help.. Try to stay cool this w/k..
How darling the tea set is, Wow that was a wonderful bargain for such great dishes! Love the kitty with the set!